So this morning I hit the road and drove to a new to me endodentist who's practice is called Soft Touch. Their web page talks about a pain free experience and is very soothing and comforting. I've done this dance a few times, and besides the first time I ever had it done, it's always been a not great experience but the fear of it is always worse than the actual experience. I wasn't expecting a LOT. The first thing that impressed me was that they did a ton of tests besides "is this tooth too sensitive to cold?". That is literally the only thing that ANYONE ever checked before deciding a root canal was necessary. They checked my bite and did tons of x-rays looking at my freakishly long roots. The freakishly long roots I have growing on my teeth might have been the cause for lots of conversation except that it turned out I had another freakish thing going on. I had stones in my teeth where there should've been pulp. That's right - STONES. Some people get stones in their kidneys, or their gall bladders, or in their saliva glands, I am growing them IN MY DAMN TEETH. 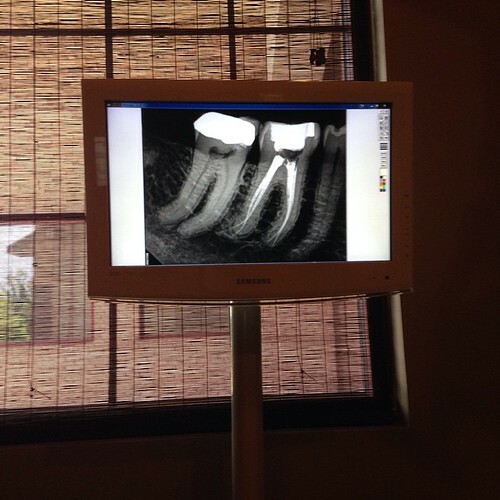 They took some other looks at my mouth and every tooth back in molar land has them on the side they were working on. It's her guess I have them in most of my teeth. This is the root of my many root canals and cracked teeth. It's officially called "pulp calcification" and so yay another weird thing I have. The doctor was super impressive right out of the gate though, I've got to say, she went over all of the tests they did and explained them, and then my x-rays and explained them. She showed me how #29 next to #30 is going to be my next likely problem because of the stones so we can just watch it. She showed me how there are stones under the crown next to today's problem tooth. She showed me how when they pulled my wisdom teeth THEY DIDN'T GET THEM ALL OUT NICE JOB DR. ROB grrrrrrr. Anyway, I have to admit, right off the bat, I was pretty relaxed with her. Shortly after 10:30 she went to work. Dentists usually say "you'll feel a sharp pinch" and it's a sharp pinch in exactly the same way that childbirth is "some pressure". However she said "This will be warm" and suddenly I'm getting a painless but warm and comforting injection. I don't know even know WHAT the heck it was. It actually didn't feel like anything. After she did several of those she followed up with the lidocaine and it was even less of an issue, she didn't bother with the "you'll feel a pinch". Instead she said "you shouldn't feel this at all". 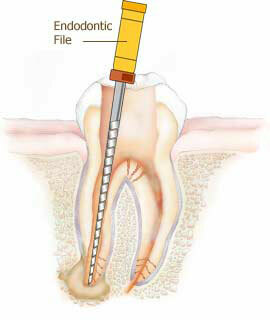 She had to drill through my old filling, and then she had to drill through the stones with a tiny high pitched thing. The stones took forever, she kept saying "WOW these are dense"...and changing gloves and instruments. At one point I felt a sharp pain shoot up my jaw and she repeated the injections and one into my tooth. Once she got through the stones, the fun began. My long roots and narrow roots gave her a really hard time apparently. She would drill and then do this long needle thing (I don't know what that is, I think they're trying to clear out your root with it like a drain snake), and I could see her consternation and she'd keep doing the same things again and again. Both the assistant and the doctor would ask me sometimes "Are we ok to keep going? Are you doing ok?" and I gotta confess, I was really super ok. I wasn't comfortable, huge bite block in my mouth, dental dam thing going on and drool running down my chin but all things considered that she was drilling into my head, I was doing ok. I would almost swear I drifted off now and again, I don't know why because I feel like I remember all of it but sometimes I'd just feel so heavy and tired that I would close my eyes. She kept assuring me "If you can keep going I can get it" and I didn't really understand what she meant. I mean, what am I supposed to do, go have lunch because it's taking too long? She got up twice to get different tools. Longer and thinner from the looks of them. So we kept at it. During the procedure the power went off three times. Once I was in the bathroom. I have to admit it's really disconcerting to be sitting on a strange toilet, pants around your ankles and the lights go off. It's MORE disconcerting with a dental dam in your mouth. But we made it through. I felt bad for them because the air conditioning kicked off. They went through more gloves than anyone I have ever seen, and more equipment they kept changing tips and things and they were sweating to death as they worked harder on getting to the bottom of my impossible roots. When it was all over, it was 1:30 in the afternoon. That's how I know I probably slept. I don't recall it taking three hours. In addition to my long curvy roots and pulp stones, I ALSO had an extra nerve bundle in that tooth that she had to dig out. Surprise! She told me I was one of the best patients she'd ever had, which amazed me. I thought she was literally the best endodontist I'd ever had so I think me being good is really just a reflection of her. But she told me afterward that most people won't sit for that long and want to do it over two days. WHO the hell would want to come back AGAIN? I came home and have napped on and off. I've got a muscle relaxer and I feel exhausted and it hurts to talk. But I survived. If I end up needing #29 done or any other tooth for that matter, I know exactly where I am going.